The unprecedented 30-0 victory by the Barbados Labour Party (BLP) at the polls on 24 May 2018 created a Constitutional crisis UNTIL St. Michael West M.P. solved the problem by agreeing to be Leader of the Opposition. Events to date confirm that the decimation of the Democratic Labour Party (DLP) caught even the BLP leadership by surprise- tinkering with the Constitution – always a messy business – with a basket of pressing issues to confront from Day 1 is not what Prime Minister Mia Mottley has the appetite for at this time. In the short term Atherley has made the sacrifice to cross the floor to assume the Leader of the Opposition role. His monthly salary will jump from 60K to 129K per annum but this is the smaller issue. He has averted the need for Mia to tangle with the issue of making deep amendments to the Constitution of Barbados at an early stage in her administration. Ask yourself, which member of parliament crosses the floor after one week of being elected without first declaring his grievances to his constituents and the wider public as a matter of courtesy? Atherley’s decision to assume the Opposition role is obviously strategic. A ‘sympathetic’ leader of the Opposition in the House of Assembly opens up a pathway for Prime Minister Mia Mottley to attack governance issues, more importantly it removes the nettlesome issue of making significant amendments to the Constitution at an early period in her tenure. The blogmaster is pleased that the citizens of Barbados have a front row seat to observe the fragility of the democracy we practice exposed. It should be a learning opportunity we grasp with both hands. A past US President Thomas Jefferson is credited with saying that “Eternal vigilance is the price of freedom”. Now more than ever in our history if the democracy we practice is to work as envisaged by the framers of the Constitution, people and stakeholder participation will be critical. The level of apathy and disaffection by citizens is well documented on BU’s pages. We need to participate in our government in ways we have not done up to now. We hope Bishop Joseph will live up to the biblical meaning of his name. OK Charlie, so you want to play the game of sticking to the letter of the Law? Why not complete the phrase and read it as referring to a “GROUP” of duly elected Members to the HOA? Where is your ‘Spirit’ of practicality and exigency for a functioning government and a sailing ship of State of which the Leader of the Opposition plays, ‘Constitutionally’, a most important role? The DLP as a political grouping has absolutely NO fingerprint or “Elected” presence in the new Parliament and hence cannot expect a seating at the senatorial table to assist in the arduous task of governmental oversight. You ought to reread the relevant section (Sec 74) in its entirety in order to help you expand your vista of appreciation of the wide ‘discretionary’ powers assigned to the GG in the appointment of a LoO. The issue which you to need to address after reading the relevant section (reproduced below) is whether any other duly elected member(s) objected to the GG’s judgment in appointing the Honourable Joseph Atherley in serving in the capacity of the Leader of the Opposition. “(1) There shall be a Leader of the Opposition, who shall be appointed by the Governor-General by instrument under the Public Seal. What is your point Mills? Are you in agreement with Professor Welch and I that Bishop Atherlys appointment as Leader of the Opposition is contrary to the provisions of the Constitution. may I explain that it was intended for those commentators who appeared to be focusing on the messenger rather than the content of the message. 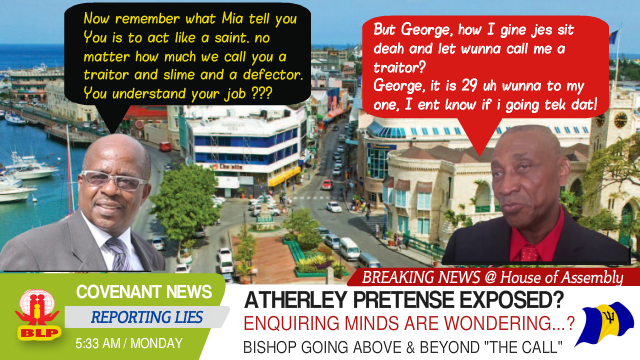 Bishop Atherley earned his LoO salary and perks today. His speech was top class, expertly balancing on the rope joining his old allegiances to his new one as lone opposition in the House. I think he did a good job, especially where he directly and clearly pointed out the possible pitfalls of her current path to the PM. As a minister he can used his influence to get at the truth. As a man of God; Bishop Atherly ought to be in the forefront of tempering justice with mercy. Thanks for reminding me that the sacrifice i am willing to sustain is not for my benefit alone but the thousands of other students whose parents might not have been able to afford University education without the increase in taxes. ………or people with cars paying increased taxes to allow those without cars to travel on Transport Board buses at an unreasonable subsidized fare of $2……. ………or people paying increased taxes so the poor could access Welfare services and grants…. ….….and people paying increased taxes so that those who refuse to pay taxes could continue enjoying benefits to which they have not contributed…. We are all Barbadians and should help each other. LOO Joseph Atherley called for a division in the wrap up of the budget debate earlier tonight.Was it to record that although he is supposed to be opposing the government he did a Deighton Mottley and voted in favoured of the budget he tried to critique?When Deighton was LOO in the early 60’s he famously replied to EWB’s budget by telling him and the House that as far as he was concerned Barrow can remain In power forever and his reply was over in less than 15 minutes. The acting PM George Payne hinted that Atherley’s speech was written for him.In th final alaysis the budget was approved in the House by a 28-0 margin two absentees being The PM and Dr Browne. My friend, it seems as though you read but do not understand….perhaps it’s because you are not prepared to view situations rationally….opting to push and holding fast to your political agenda, no matter how silly or unreasonable it is……or how WRONG you are. What annoys me with people like is if the DLP included reintroducing state funded UWI education in their 2018 manifesto……. ……..you would be in this forum presenting all types of reasons to JUSTIFY their decision. The point is that although an individual may come from an impecunious household, he/she should not be denied the opportunity to gain tertiary level education because they are poor. The state should look after the poor and vulnerable in the society. Rather than coming to forum to REPEATEDLY criticize the new BLP administration with the SAME arguments,…….what you need to do is give them TIME to work. BTW…..after 10 years of “disrespectful silence,” your DLP colleagues, namely the “Fabulous Four,” have now found their voices. I trust Doug de Dem at the hellum of CBC don’t ever be so drunk as to bring those outcasts DLP has beens into our living rooms.If you ever get so drunk as to do that,your donkey will be grass the very next day,mark my word. Rump=a small or unimportant remnant of something originally larger. And I doan have to give nobody the defintion of hind part.